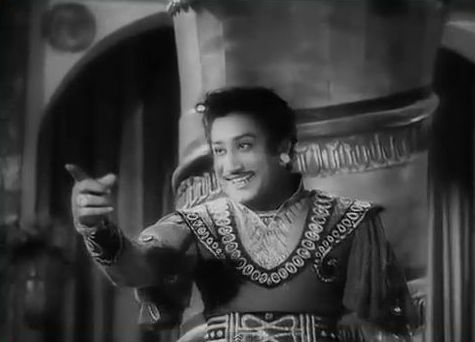 The excerpted passages from the book written by Barnouw and Krishnaswamy relates to Sivaji Ganesan at a time when the actor was in the zenith of his 47-year-long film acting career. From his first film ‘Paraasakthi’ in 1952 to his last film ‘Pooparikka Varugiroam’ in 1999, Sivaji Ganesan acted in 307 movies in all. Of these 296 were in the Tamil language; six were in Telugu; two each in Hindi and Kannada. One in Malayalam. At a time when the success of a film was gauged by the number of days it was screened at a stretch in theatres, 178 of his movies ran for more than a 100 days in cinema halls; 16 of these ran for 25 weeks celebrating silver jubilees. 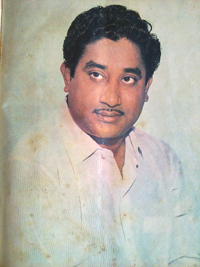 Sivaji Ganesan’s most productive period in terms of film output was in the 22 year period from 1953 to 1975. During this time Sivaji acted in over 200 films at the rate of seven to 10 films per year. Since he played the weighty lead role in most of these films, Sivaji had to devote a great deal of time as he had to act in many, many scenes. This naturally resulted in a hectic work schedule. Through his dedication, hard work, skill and ability Sivaji Ganesan made a success of himself on the silver screen. In the process he inspired a whole generation of artists, virtually creating a new school of acting. Despite achieving stupendous success on the screen, Sivaji remained faithful to his first love, the stage, and acted in plays for decades. His acting career, which began at the age of eight, could be divided into three phases – 1936 to 1952, when he acted only on stage; 1952 to 1974, when he acted for the big screen and also gave stage performances; and 1974 to 1999, when he acted only in films. 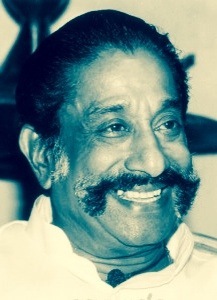 Sivaji Ganesan born on 1 October 1928 passed away at the age of 72 on 21 July 2001. His 90th birth anniversary will be celebrated in October this year. ‘Spotlight’ too commemorates the 90th birthday of the great Thespian by way of this article. A brief outline of Sivaji Ganesan’s life and work will be presented with the aid of earlier writings. A closer look at the multi-faceted personality with specific insights into important and interesting aspects of his eventful career will be provided. Vizhuppuram Chinniah Ganesan, or V.C. Ganesan, was born on 1 October 1928, in Vizhuppuram, which was then in the Arcot region of the former Madras Presidency. His parents were Chinnaiapillai Mandrayer, a railway employee and freedom fighter, and Rajamani, in whose name he was to launch later a successful film company, Rajamani Pictures. Ganesan Whose full name was Ganesamoorthy belonged to the Kallar division of the Mukkulathor caste. His ancestors hailed from Soorakkottai in Thanjavoor District. Smitten by a street drama about Kattabomman, the feudal Polygar (Paalayakkaaran) of Panchalan-kurichi who fought the British, young Ganesan became enamoured of acting and abandoned school when he was in Class Two. Forsaking home, he along with his boyhood chum “Kaka” Radhakrishnan (veteran comedian who passed away in 2012) joined the Madurai-based Bala Gana Sabha drama troupe first, and later the troupe run by Ethaartham Ponnusamipillai. From child roles he graduated to female roles and then on to the “Raja part,” the role of the hero, as it was known then. The first landmark in his acting career was his portrayal of the Maratha warrior Sivaji in the drama ‘Sivaji Kanda Indhu Rajyam’ written by Dravida Kazhagham and later Dravida Munnetra Kazhagam Leader C.N. Annadurai, who went on to become the Tamil Nadu Chief Minister. E.V. Ramaswamy, the patriarch of the Dravidian movement, acclaimed his stellar performance and referred to Ganesan as ‘Sivaji’ Ganesan. This was in 1946. The sobriquet stuck. The big break in Sivaji’s career came in 1952, when he acted as the hero in ‘Parasakthi,’ a film directed by Krishnan-Panju. The dialogue, written by DMK Leader and former Chief Minister M. Karunanidhi in fiery and flowery prose with a surfeit of alliterations, the hallmark of Karunanidhi’s style, came powerfully alive in a stunning performance by Sivaji, unparalleled in Tamil cinema. The monologue uttered as an address to Tamil Nadu in the earlier scenes and the courthouse speech in the closing stages of the film were classic instances of delightful oratory. A star had arrived in Tamil cinema. Sivaji had an extraordinary flair for dialogue delivery. He pioneered an exquisite style, diction, tone and tenor. Later other scriptwriters, such as MS Solaimalai, Sakthi Krishnaswamy, Aaroor Das, and ‘Vietnam Veedu’ Sundaram, were to provide dialogue that tapped his diction, which rendered the Tamil language euphonious. There were many notable films where his remarkably resonating dialogue delivery delighted and enthralled fans. Starting from his brilliant debut in ‘Parasakthi,’ film after film made indelible impressions in this regard. Thirumbipaar, Manohara, Thookkuthookki, Illara Jyothi, Anbu, Rajarani, Ethirpaaraathathu, Annayin Aanai, Kuravanji, Maruthanaatu Veeran, Ambikapathy, Veera Pandiya Kattabomman, Kappalotiya Thamizhan, Paasamalar, Aalayamani, Karnan, Thiruvilaiyaadal, Saraswathi Sabatham, Kandan Karunai, Thirumaal Perumai, Sivantha Mann, Gauravam, Rajaraja Chozhan, Thangapathakkam, etc., are but some of the films remembered still for the Sivaji’s sparkling ‘vasanam’. A generation of actors and aspirants modelled themselves on his style. Despite this mass attempt to imitate and emulate him there was no replicating or duplicating the veteran. This stylish, dramatic presentation was essentially considered to be a feature suitable for the stage rather than the screen. A device used frequently in his earlier films to give an outlet to his histrionic talents was the inclusion of short historical dramas – on the Chera King Senkuttuvan, Akbar’s son Salim or Jahangir, Socrates, Emperor Asoka among others – within the main plot, often dealing with a social theme. His acting ability received maximum exposure in the bantering arguments Veerapandiya Kattabomman has with his British adversaries in the eponymous film. Sivaji received the best actor award for this role at the Afro-Asian film festival held in Cairo in 1960. Sivaji’s talents were by no means restricted to his oratorical prowess and powerful dialogue delivery. He could emote all the nine moods (navarasas) realistically. This skill found scope in all his films but came out into full play in his 100th film Navarathri in 1964, in which he played nine different characters signifying wonder, fear, compassion, anger, gentleness, revulsion, romantic passion, courage and happiness. His other commendable multi-role performances were in Uthama Puthiran and Enga Oor Raja in dual roles, and Thrishoolam, Deiva Magan and Bale Pandiya in which he did three roles each. Sivaji Ganesan played a wide range of characters, from god and king to commoner. Whether it was the mercurial Chola emperor Raja Raja Cholan, Lord Siva, Lord Muruga, Saivite saint Appar, Vaishnavite saint Periyaalvar or Tamil poet Ambigapathy, Sivaji was always at his scintillating best. He was equally splendid in contemporary roles and stereotypes making every performance a memorable one. Superb among them are his roles as Bharatha in Sampoorna Ramayanam, the patriotic lawyer Chidambaram Pillai in Kappalottiya Thamizhan, the nagaswaram player Sikkal Shanmugasundaram in Thillana Mohanambal, Prestige Padmanadha Aiyer in Vietnam Veedu, Barrister Rajanikanth in Gauravam and Police Superintendent Chaudhury in Thangapadhakkam. Scenes from some of his films remain etched in memory: the ‘Yaaradi Nee Mohini’ song sequence in Uttama Puthiran, where Sivaji’s mannerisms would remind present day movie-goers of Rajnikanth’s style; the physically challenged Ponniah in Bhagapirivinai, the inimitable gait as the fisherman in Thiruvilayadal and the clash with Tamil scholar Nakkeeran in the same film; his duel over artistic superiority with Padmini in Thillana Mohanambal; particularly during the ‘Nalanthaana?’ song sequence; and the Othello drama sequence in English with Savithri as Desdemona in Iratha Thilakam. Sivaji had an astounding capacity to synchronise lip and body movements to playback renditions making it appear as if he was actually rendering these songs. Singers Chidambaram Jeyaraman, Seerkazhi Govindarajan and A.M. Raja in the earlier days and T.M. Soundararajan later gave voice to his songs, making the singing and speaking voices blend as an indivisible entity. T.M. Soundarajan’s voice suited Sivaji most. Sivaji’s own voice was woven into songs at times. Two memorable songs are ‘Vannathamizh Pennoruthi Vandhaal’ by C.S. Jayaraman in Paavai Vilakku and ‘Thendrolodu Udan Piranthaal Senthamizh Pennaal’ by T.R. Mahalingam in Rajarajachozhan. There is also ‘Poatrippaaradi Pennae in “Devar Magan’. Several directors, among them Krishnan-Panju, T.R. Sundaram, L.V. Prasad, B.R. Panthulu, T. Prakash Rao, A. Bhim Singh, K. Shankar, A.P. Nagarajan, A.C. Tirulokchandar, Sridhar, P. Madh-avan, K.S. Gopalakrishnan and K. Vijayan, directed Sivaji in vastly different roles, bringing out his versatility. Sivaji himself paid tribute to L.V. Prasad saying it was Prasad who taught him the rudiments of acting for the camera. Sivaji’s chief lead actor contemporaries were “Puratchi Nadigar” M.G. Ramachandran (MGR), his namesake Gemini Ganesan (Kadhal Mannan) and “Ilatchiya Nadigar” S.S. Rajendran (SSR). The only film he acted together with MGR was the controversial ‘Koondukkili’ by T.R. Ramanna. With Gemini he acted in many hits like Pennin Perumai, Pathi Bhakthi, Veerapandiya Kattabomman, Paarthaal Pasi Theerrum, Paasamalar, Pandha Pasam, Kappalottiya Thamizhan, Saraswathy Sabatham, Thiruvarutselvar and Unakkaaha Naan. He also acted with SSR in films like Parasakthi, Rajarani, Deivappiravi, Aalayamani, Shanthi, Pachai Vizhakku, Pazhani, Kaikodutha Deivam, etc. Ironically, the man hailed as the greatest actor of Tamil cinema never won an Indian national award for best actor. He was conferred the Dadasaheb Phalke lifetime achievement award for meritorious service to Indian cinema in 1997.The Tamil film journal Pesum Padam gave him the honorific ‘Nadigar Thilagam’ (doyen of actors). ‘Radio Ceylon’ as the Sri Lanka Broadcasting Corporation (SLBC) was known then bestowed upon him the title “Kalaikkurusil”. Sivaji was honoured with the titles Padma Shri and Padma Bhushan and the Tamil Nadu Government conferred on him the Kalaimamani award. The French Government honoured him with Chevalier in the Order of Arts and Literature. « Why Do We Need To Enact Fresh Laws To Deal With Terrorism At This Juncture?